July 2017: Welcome to the group Tatek Lemma! April 2017: Welcome to the group Stu Earl! April 2017: Farewell Jonathan, good luck in Trieste! February 2017: FLEET Postdoc position is currently advertised here. Applications close 6 March! September 2016: Great news! Our bid for a new $40m Centre of Excellence in Future Low-Energy Electronics Technologies (FLEET), with partners at Monash, UNSW, RMIT,.... has been successful. Post doc and PhD advertisments to come. June 2016: Tim's article on lasing in nanowires is published in Nature Communications: Nat. Comms 7, 11927 (2016). Dec 2015: Jonathan's thesis has been accepted! (days before his wedding!). Double congratulations!! Nov 2015: Fabio's article "Vibronic Resonances Facilitate Excited-State Coherence in Light-Harvesting Proteins at Room Temperature" is published in J. Phys. Chem. Lett. 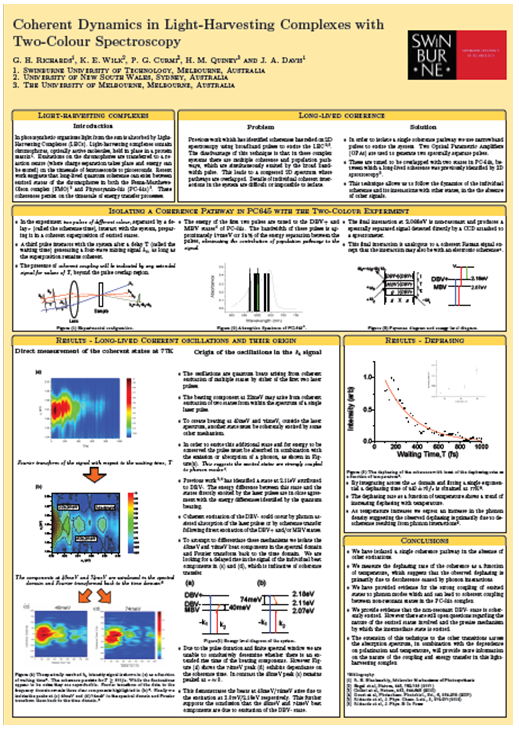 Sept 2015: Congratulations Ashkan: best student presentation at Asian Spectroscopy conference. March 2015: Welcome to the group Pavel! A new PhD student. 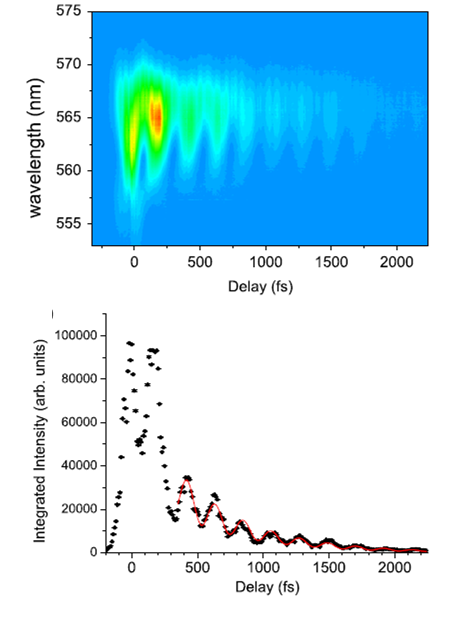 Feb 2015: First results from new 125kHz laser with 15fs NOPOA pulses! Time resolved PL from nanowires! Nov 2014: The new Light Conversion laser system has been installed!! See *** for photos of the new lab as it develops. May 2014: Gethin's thesis titled "Quantum Coherence in PC645" is accepted. Congratulations Dr Richards! Mar 2014: Jon's article "Isolating quantum coherence using coherent multi-dimensional spectroscopy with spectrally shaped pulses" is published in Optics Express. Jan 2014: Fabio Novelli has joined the group as a postdoc. Dec 2013: Gethin's article "Disentangling Electronic and Vibrational Coherence in the Phycocyanin-645 Light-Harvesting Complex" is published in J. Phys. Chem. Lett. Nov 2013: Ashkan Roozbeh has joined the group as a PhD student. Laser & Photonics Reviews 11, 1600249 (2017). Nature Communications 7, 11927 (2016). J. O. Tollerud and J. A. Davis. Journal of the Optical Society of America B 33, C108-114 (2016). F. Novelli, A Nazir, G . H. Richards, A. Roozbeh, K. E. Wilk, P. M. G. Curmi, and J. A. Davis. Journal of Physical Chemistry Letters 6, 4573 (2015). Journal of Physical Chemistry Letters 5, 43 (2014). The ability to completely describe the properties, dynamics and mechanisms that determine and influence the function of complex systems can provide tremendous impetus for the development of future technologies. The key to understanding these systems is being able to map out the quantum mechanical states and the interactions between them and between the system states and the environment or external stimuli. Through our research, we aim to develop a series of experimental methods based on quantitative multidimensional optical spectroscopy that will allow us to access this information in unprecedented detail. As we develop and enhance these techniques, we are applying them to various condensed matter systems, from semiconductor nanostructures to photosynthetic light-harvesting complexes. Follow the links below to find out more about some of our research directions. Jonathan Tollerud, Dr. Christopher Hall, Dr. Jeffrey Davis. In order to completely describe the properties, dynamics and mechanisms that determine the function of complex systems we need techniques that are capable of separating and quantifying different contributions. We are working towards developing experimental techniques that will enable us to achieve just that. Many of them based on coherent multi-dimensional spectroscopy (CMDS) and the advantages it provides. CMDS experiments are similar to multidimensional NMR, and in principle can break down complex structures and dynamics into multidimensional datasets, with each. We are developing experimental approaches that will make these techniques quantitative and more capable of fully and quantitatively describing complex systems. You can find more details regarding some of our recent work in these areas below, or for more information please contact Dr. Jeff Davis. Fig. The basic configuration of the SLM based CMDS experiment. 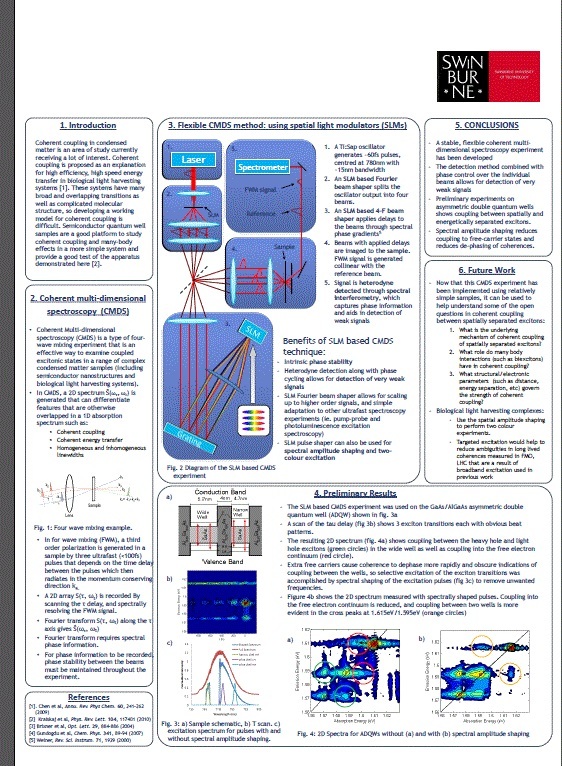 Coherent Multi-Dimensional Spectroscopy (CMDS) is a powerful tool for examining electron coupling and dynamics in a wide range of condensed matter systems, including semiconductor nanostructures and biological light harvesting complexes. This technique utilises multiple phase locked laser pulses to excite and probe electronic transitions within the sample during various time periods. The phase and amplitude of the emitted signal are recorded using spectral interferometry. From the data a 2D and/or 3D spectrum can be generated which provides information including which states are coupled, the nature of the coupling, the homogeneous and inhomogenous linewidths, if peak broadening is correlated and the presence of many-body effects. 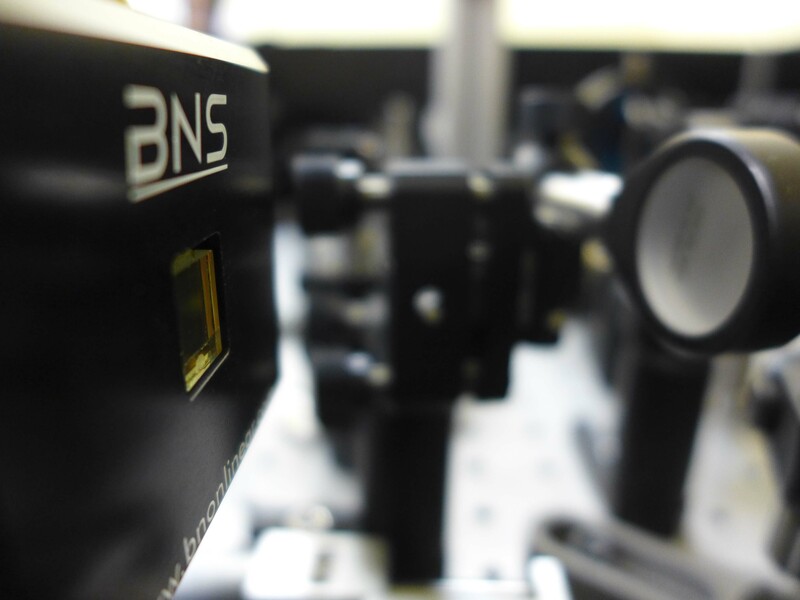 The spatial light modulator (SLM) based CMDS experiment in the Ultrafast Spectroscopy group is based on a design pioneered at the Massachusetts Institute of Technology. A SLM based beam shaper is used to split the input laser beam into four spatially separated and co-propagating beams. A SLM based pulse shaper is used to control the pulse time delays. As all pulses are incident on the same optics the pulses are phase locked. Three of the pulses are used to excite the sample, and the remaining pulse is used to perform spectral interferometry with the emitted signal. The signal is recorded as a function of the time delay between each of the excitation pulses. The multi-dimensional spectrum is then produced by Fourier transforming the detected signal as a function of the excitation pulse time delays. 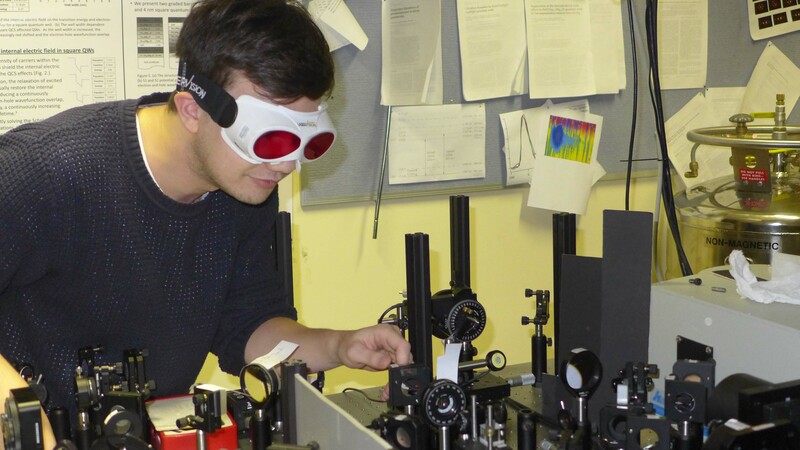 The ultrafast spectroscopy group at Swinburne is the only group in Australia with the experimental capability to perform coherent multi-dimensional spectroscopy. Optics Express 22, 6719 (2014). Fig. A region of the three-dimensional spectrum for the zero-quantum coherence quantum pathway pulse ordering. 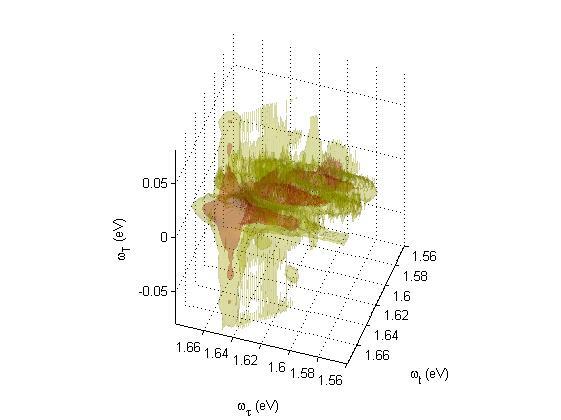 In this figure four well defined peaks are shown which are due to coherent coupling between spatially separated excitons localised to different quantum wells in an asymmetric double quantum well sample. Simple systems with well-defined and separated energy levels generally produce clear multi-dimensional spectra from which it is straight forward to identify the contributing quantum pathways. Such samples are well suited for examination using broadband CMDS. In more complex systems where spectral broadening leads to overlapping peaks in multi-dimensional spectra, it can be impossible to separate the contributing quantum pathways. Furthermore, in systems where many-body effects are important, such as semiconductor quantum wells, the excitation of the free-carrier continuum can alter the dynamics of excitons localised to the same quantum well. Such complexities can be significantly simplified by using pathway selective CMDS approach to isolate specific quantum pathways. In our pathway selective CMDS experiment we use a spatial light modulator based pulse shaper to spectrally shape the excitation pulses. As all excitation pulses are incident on the SLM surface, the spectrum of each excitation pulse can be controlled, yet remain phase-locked. Applied to studying coupled excitons in asymmetric double quantum wells we show that this approach has multiple benefits, including unambiguous quantum pathway identification in multi-dimensional spectra and reduced noise levels on peaks corresponding to weakling coupled states compared to broadband 2D and 3D spectra containing peaks with amplitudes varying over several orders of magnitude. This is an important first step towards quantitative CMDS for complex systems, without the need for multi-parameter fits of crowded 2D spectra. It has been well-established that the relative orientation of transition dipoles can affect signal strengths in CMDS experiments. Furthermore, by controlling the polarization of each pulse certain pathways can be enhanced or eliminated. We have exploited the processes that underlie both of these facts to reveal structural information of some components of the light harvesting complex PC645. We are working towards enhancing this approach to obtain more and more detailed structural information in more complex systems. Solving structure in the CP29 light harvesting complex with polarization-phased 2D electronic spectroscopy Naomi S. Ginsberg, Jeffrey A. Davis, Matteo Ballottari, Yuan-Chung Cheng, Roberto Bassic and Graham R. Fleming	Proceedings of the National Academy of Sciences 108, 3848 (2011). Fig. Flow chart representing the phase retrieval algorithm. We have developed a technique that determines the phase of the signal emitted in a coherent multi-dimensional spectroscopy experiment from spectrally resolved intensity data without phase stabilised excitation pulses. Using this technique it is possible to perform CMDS in situations where heterodyne detection is impractical, such as two-colour CMDS experiments. Two colour CMDS well suited for performing quantum pathway specific experiments, as well as for accessing spectral regions inaccessible by broadband laser sources. Phase retrieval algorithms have proven to be effective in multiple areas of physics. In frequency resolved optical gating (FROG), which is a technique used for measuring ultra-short pulses, the algorithm recovers the pulse intensity I(t) and phase φ(t). The algorithm converges to the correct solution by applying constraints on what values the solution can take in time and frequency space based on the known time response of the signal, which depends on the FROG configuration used. In coherent diffractive imaging, where the phase information is required to perform the inverse Fourier transform to reconstruct the sample structure from its diffraction pattern, spatial constraints based on the dimensions of the sample and detector are used. The phase retrieval algorithm developed in our group draws on these two approaches by applying restrictions on the allowed time regions over which the signal should exist (based on causality), as well as using known information about the absorption and emission energies of the sample. Comparisons between this non-interferometric technique and the more standard interferometric approaches have shown that non-interferometric CMDS can accurately retrieve the phase information and that the two techniques produce equivalent multi-dimensional spectra. We have used this technique to reveal coherent coupling in carotenoids from photosynthetic systems and to explore coherent coupling between spatially separated excitons in asymmetric double quantum wells. New Journal of Physics 15, 045028 (2013). The Journal of Chemical Physics 135, 044510 (2011). The Journal of Chemical Physics 134, 024504 (2011). New Journal of Physics 12, 085015 (2010). Physical Review Letters 100, 227401 (2008). Gethin Richards, Ashkan Roozbeh, Dr. Fabio Novelli, Dr. Jefffrey Davis. Photosynthesis is the process by which energy from the sun is absorbed (by plants, algae, some bacteria) and stored in chemical bonds. In the early stages the energy is absorbed by chromophores in pigment protein complexes and then transferred to other chromophores and complexes before reaching the reaction centre, where all the biochemistry starts to happen. These energy transfer steps occur with very high quantum efficiency. The precise mechanism of the different energy transfer processes remains a subject of some conjecture. Recent work has suggested that non-trivial quantum effects may be playing an important role, but clear experimental evidence for coherent transfer or the necessity of quantum coherence remains elusive. More recently, it has been suggested that vibrational modes of the pibment protein complex may be playing an important role in mediating some of these energy transfer steps. We are working towards developing a detailed understanding of the relevant quantum effects and the nature of the interactions between electronic and vibrational states which can lead to efficient energy transfer. In pursuing these goals we have developed and utilised a number of experimental approaches and we are always looking to get more information and detail that will help us understand these highly complex systems. Light-harvesting complexes are the molecules responsible for the initial stages of photosynthesis, where light from the Sun is converted into excited electronic states of the molecule. These excitations are then transferred within and between light-harvesting complexes towards a reaction centre where energy can be stored. The transfer processes necessarily occur on vanishingly short timescales, so that the energy can be reach the reaction centre before the excitation is quenched. Light-harvesting complexes have evolved to optimize the efficiency of these processes; however, the physical mechanisms behind the energy transfer are still not fully understood. Recently it has been proposed that quantum mechanical coherence between excited states may play a significant role in energy transfer within the light-harvesting complex, Phycocyanin-645 (PC-645). Our work investigates these complexes we utilize a two-colour four-wave mixing experiment. The advantage of this experiment is that two spectrally narrow pulses (i.e. without any spectral overlap) are used to excite the complex, meaning that only coherences are probed, in isolation from other signals. Our work has used this technique to isolate decoherence times, which are typically difficult to measure in 2D spectroscopy. Further these experiments presented evidence for strong coupling between the electronic states and the phonon bath, which are suggested to be important for energy transfer within the complex. 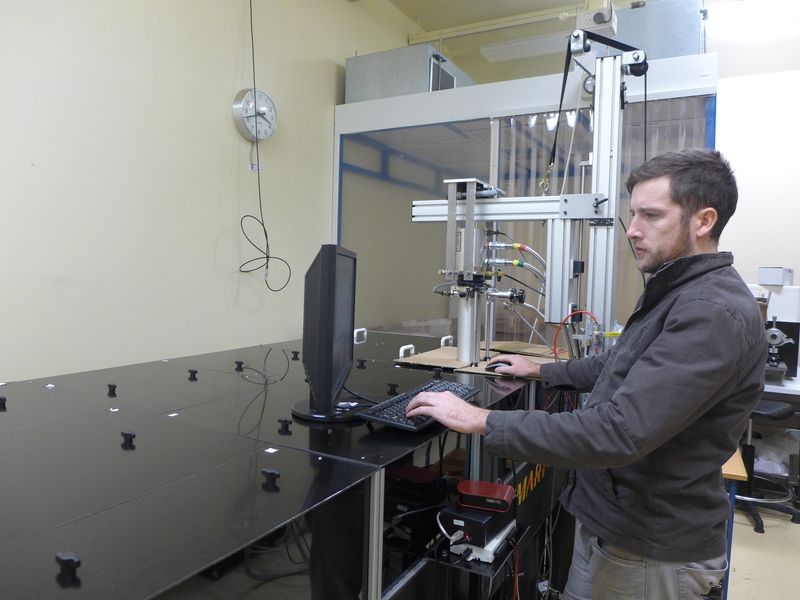 Recently we have adapted polarization control to the two-colour experiment. This technique helps to separate signals from electronic coherence which typically have similar signatures to vibrational coherences in this type of experiment. For PC-645 a detailed picture of the energy landscape within this complex has been built up by using this approach across a range of pulse wavelengths. Vibronic Resonances Facilitate Excited-State Coherence in Light-Harvesting Proteins at Room Temperature F. Novelli, A Nazir, G . H. Richards, A. Roozbeh, K. E. Wilk, P. M. G. Curmi, and J. A. Davis. Journal of Physical Chemistry Letters 6, 4573 (2015). Disentangling Electronic and Vibrational Coherence in the Phycocyanin-645 Light-Harvesting Complex G . H. Richards, K. E. Wilk, P. M. G. Curmi, and J. A. Davis. Journal of Physical Chemistry Letters 5, 43 (2014). Excited state coherent dynamics in light-harvesting complexes from photosynthetic marine algae. G.H. Richards, K. Wilk, P.M.G. Curmi, H.M. Quiney and J.A. Davis,Journal of Physics B: Atomic, Molecular and Optical Physics 45, 154015 (2012). Coherent vibronic coupling in light-harvesting complexes from photosynthetic marine algae	G.H. Richards, K. Wilk, P.M.G. Curmi, H.M. Quiney and J.A. Davis,	Journal of Physical Chemistry Letters, 3, 272 (2012). Fig. (Top) The spectrally resolved third-order signal from lycopene in n-hexane. Pulse-1 has a wavelength of 503 nm and pulse-2 and pulse-3 have a wavelength of 532 nm. The signal extends out to a t23 delay of nearly 2 ps, indicating coherent coupling between states. The modulations indicate interference with another state and/or transition. (Bottom) The same data spectrally integrated, with the fit to an oscillating exponential decay in red, giving a coherence time of 1000 fs and a beat period corresponding to an energy splitting of 156 cm-1. We use two-colour vibronic coherence spectroscopy to observe long-lived vibrational coherences in the ground electronic state of carotenoid molecules, with decoherence times in excess of 1 ps. Lycopene and spheroidene were studied isolated in solution, and within the LH2 light-harvesting complex extracted from purple bacteria. The vibrational coherence time is shown to increase significantly for the carotenoid in the complex. Using this technique, we are also able to follow the evolution of excited state coherences and find that for carotenoids in the light-harvesting complex the S2|S0 superposition remains coherent for more than 70 fs. In addition to the implications of this long electronic decoherence time, the extended coherence allows us to observe the evolution of the excited state wavepacket. These experiments reveal an enhancement of the vibronic coupling to the first vibrational level of the C–C stretching mode and/or methyl-rocking mode in the ground electronic state 70 fs after the initial excitation. These observations open the door to future experiments and modelling that may be able to resolve the relaxation dynamics of carotenoids in solution and in natural light-harvesting systems. Long lived coherence in carotenoids	J. A. Davis, E. Cannon, L. Van Dao, P. Hannaford, H. M. Quiney, K.A. Nugent	New Journal of Physics 12, 085015 (2010). 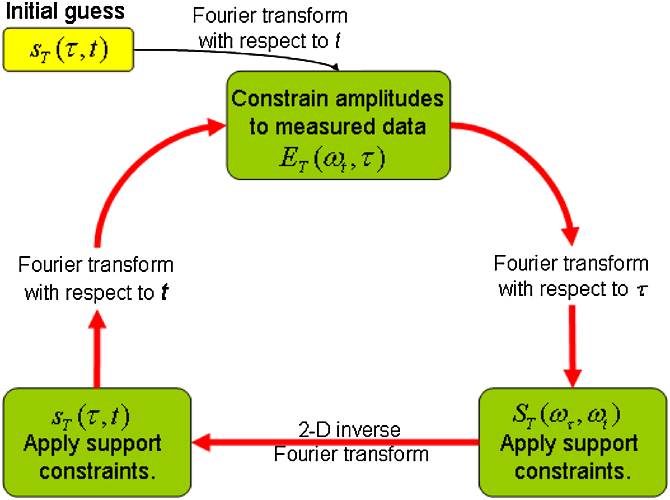 Non-interferometric two-dimensional Fourier transform spectroscopy J.A. Davis, L.V. Dao, M.T. Do, P. Hannaford, K.A. Nugent, and H.M. Quiney Physical Review Letters 100, 227401 (2008). Jonathan Tollerud, Dr. Christopher Hall, Dr. Jefffrey Davis. Semiconductor nanostructures, such as quantum wells, quantum dots and nanowires are increasingly being utilised in light emitting and absorbing devices due to their strong optical transitions and easy integration with standard semiconductor electronics. Furthermore, the ability to drastically change their properties by controlling the size, shape and distribution of nanostructures makes them an ideal template to explore fundamental physics. Some of our recent work on semiconductor nanostructure is described in more detail below, but for more information on this work please contact Dr. Jeff Davis. 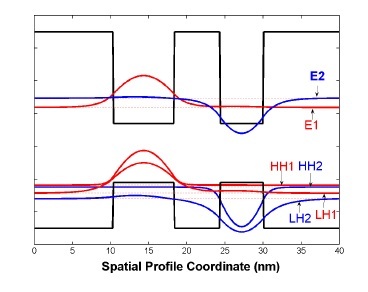 We demonstrate how spectral shaping in coherent multidimensional spectroscopy can isolate specific signal pathways and directly access quantitative details. By selectively exciting pathways involving a coherent superposition of exciton states we are able to identify, isolate and analyse weak coherent coupling between spatially separated excitons in an asymmetric double quantum well. Analysis of the isolated signal elucidates details of the coherent interactions between the spatially separated excitons. With a dynamic range exceeding 104 in electric field amplitude, this approach facilitates quantitative comparisons of different signal pathways and a comprehensive description of the electronic states and their interactions. Isolating quantum coherence using coherent multi-dimensional spectroscopy with spectrally shaped pulses	J. O. Tollerud, C. R. Hall, and J. A. Davis	Optics Express 22, 6719 (2014). a box around them. Each slice covers a range of 7 meV along the ωT axis. We utilize a three-dimensional (3D) visible spectroscopy to reveal and explore coherent coupling between excitons localized to GaAs quantum wells separated by barriers 4 and 6 nm wide. The coupled excitons were energetically separated by 43 meV, close to the longitudinal optical phonon energy, due to the different widths of the quantum wells to which they were localized. The ability to isolate coherence pathways in 3D spectroscopy has made it possible to not only identify weak coherent coupling, but also to explore the nature of the coupling through analysis of the peak shapes. 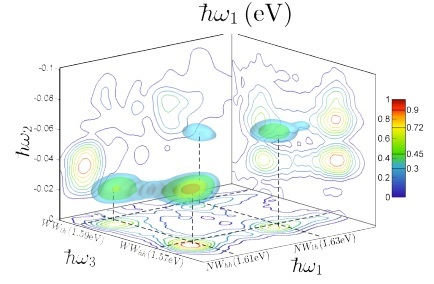 This peak shape analysis showed inhomogeneous broadening of the excitons localized to different wells to be uncorrelated, as expected, while coupling between heavy-hole and light-hole excitons localized to the same well was shown to be correlated. To gain some insight into the coupling mechanism we explored the dependence of the coupling strength on the barrier width and hence spatial separation. 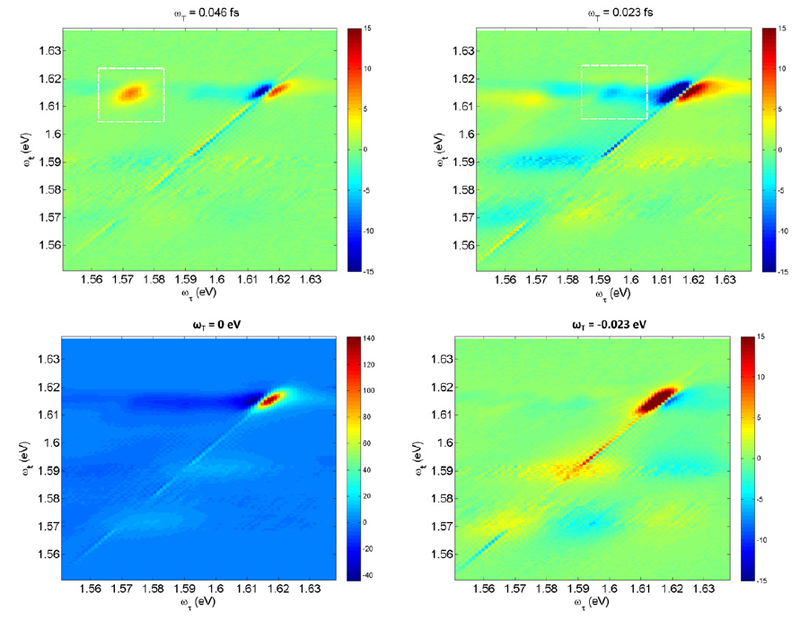 Based on these results we discuss the possibility of phonon-assisted dipole coupling. Fig. The solution to the 3D phase retrieval problem is plotted as a function of the three spectral dimensions, ωτ, ωT , and ωt. The red and yellow isosurfaces represent the data with constant amplitudes. We demonstrate three-dimensional (3D) electronic spectroscopy of excitons in a double quantum well system using a three-dimensional phase retrieval algorithm to obtain the phase information that is lost in the measurement of intensities. By extending the analysis of two-dimensional spectroscopy to three dimensions, contributions from different quantum mechanical pathways can be further separated allowing greater insight into the mechanisms responsible for the observed peaks. By examining different slices of the complete three-dimensional spectrum, not only can the relative amplitudes be determined, but the peak shapes can also be analysed to reveal further details of the interactions with the environment and inhomogeneous broadening. We apply this technique to study the coupling between two coupled quantum wells, 5.7 nm and 8 nm wide, separated by a 4 nm barrier. Coupling between the heavy-hole excitons of each well results in a circular cross-peak indicating no correlation of the inhomogeneous broadening. An additional cross-peak is isolated in the 3D spectrum which is elongated in the diagonal direction indicating correlated inhomogeneous broadening. This is attributed to coupling of the excitons involving the two delocalised light-hole states and the electron state localised on the wide well. The attribution of this peak and the analysis of the peak shapes is supported by numerical simulations of the electron and hole wavefunctions and the three-dimensional spectrum based on a density matrix approach. An additional benefit of extending the phase retrieval algorithm from two to three dimensions is that it becomes substantially more reliable and less susceptible to noise as a result of the more extensive use of a priori information. A video showing the the 3D spectrum in greater detail can be found here. T. Burgess, D. Saxena, S. Mokkapati, Z. Li, C.R. Hall, J. A. Davis, Y. Wang, L.M. Smith, L. Fu, P. Caroff, H.H. Tan, C. Jagadish. G . H. Richards, K. E. Wilk, P. M. G. Curmi, and J. A. Davis. Isolating quantum coherence using coherent multi-dimensional spectroscopy with spectrally shaped pulses. J. O. Tollerud, C. R. Hall, and J. A. Davis. 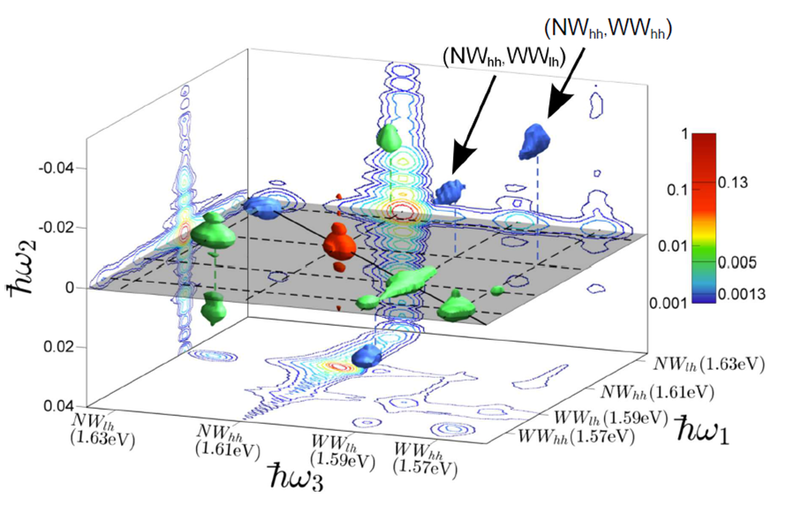 Three-dimensional electronic spectroscopy of excitons in asymmetric double quantum wells. C.R. Hall, J.O. Tollerud, H.M. Quiney, J.A. Davis. Excited state coherent dynamics in light-harvesting complexes from photosynthetic marine algae. Journal of Physics B: Atomic, Molecular and Optical Physics 45, 154015 (2012). Journal of Physical Chemistry Letters, 3, 272 (2012). Chemical Physics letters 523, 1 (2012). Proceedings of the National Academy of Sciences 108, 3848 (2011). Applied Physics Letters 96, 193117 (2010). Physical Review B 80, 235316 (2009). Laser and Photonics Reviews 3, 85 (2009). Journal of Materials Science: Materials in Electronics 18, 363 (2007). Journal of Materials Science: Materials in Electronics 18, 305 (2007). Applied Physics Letters 90, 221914 (2007). Applied Physics Letters 90, 081105 (2007). Applied Physics Letters 89, 182109 (2006). 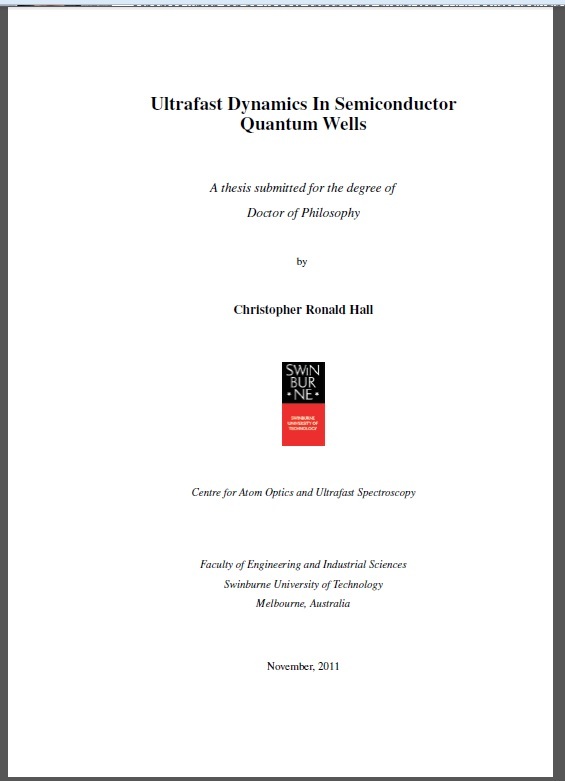 ZnO/ZnMgO Quantum Wells J.A. Davis and C. Jagadish, in GaN and ZnO-based Materials and Devices ed. S.J. Pearton, (Berlin: Springer-Verlag), ISBN: 9783642235214, p 413-434 (2012). Semiconductors and their nanostructures J.A. Davis and C. Jagadish in Optical Techniques for Solid State Materials Characterization ed. R.P. Prasankumar and A.J. Taylor, (Boca Raton: Taylor and Francis), ISBN: 9781439815373 (2011). This project will build on recent developments in our group that have revealed new physics in semiconductor nanostructures. The primary focus will be on exploring the excitons in these nanostructures and the transition from non-interacting to strongly interacting. The experiments will utilise a highly sensitive coherent multidimensional spectroscopy experiment, which has allowed us to explore new parameter regimes. This experiment and the many variations that have been developed provide direct insight into interactions between excitons that can be: co-located or well-separated; in the dilute limit or in the many-body limit; and spatially zero-, one-, or two-dimensional. The capability to fully explore these parameter regimes promises to reveal new and exciting physics. The aim of this project is to extend coherent multidimensional spectroscopy techniques that have been developed at Swinburne into the near-UV spectral region, and utilse them to understand complex biochemical interactions. 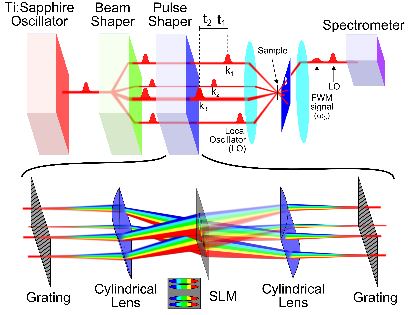 Coherent multidimensional spectroscopy is a rapidly advancing technique, with variations that are capable of resolving quantum coupling, many-body effects, energy transfer pathways and dynamics, as well as structural information. This project will make use of these techniques to directly probe the electronic states of the relevant protein components that drive biochemical interactions. This is achieved without the need for fluorescent tags and will provide insight into the dynamics and mechanisms of such highly complex interactions. The successful candidate will have a strong Physics, Chemical Physics or Biophysics background (honours degree or equivalent) and a willingness and ability to learn the physics underlying the experimental techniques, the biology of the relevant processes to be studied and the interaction between the experiment and the biological systems under investigation. Recent work has identified the presence of long-lived coherences amongst different molecules within some light-harvesting complexes involved in photosynthesis. Using the techniques developed here at Swinburne, we are able to study directly these quantum mechanical processes in detail. This project will explore the role of quantum coherence and electronic-vibrational coupling in photosynthesis by studying the dynamics of both coherent and classical energy transfer, within the isolated molecules and between the molecules within light-harvesting complexes. The ultimate aim is to develop an in depth understanding of the mechanisms responsible for the efficient energy transfer in photosynthesis. Raman optical activity uses circularly polarized light to probe the optical activity of chiral molecules. The phenomenon is observed as a small difference in the intensity of Raman scattering from right- and left-circularly polarized incident light. The distinctive chiroptical features of many biomolecules, such as proteins and DNA, play an important functional role in living organisms. Many drugs can exist in different enantiomeric (mirror image) states that can display markedly different chemical and biochemical reactivities. Indeed, the mirror-image versions are often ineffective, or even harmful. This project will develop a Stimulated Surface-Enhanced Raman Optical Activity experiment with femtosecond time resolution. This will enable the observation of ultrafast structural changes such as those occurring during protein folding or asymmetric chemical reactions. This project will extend current multidimensional spectroscopy approaches by adding high spatial resolution. Standard microscopy approaches have been implemented but are limited in their spatial resolution by the diffraction limit of light. One way of exceeding the diffraction limit is to move into the near-field. Recent theory work has identified a means of performing CMDS with nanometre resolution using plasmonic structures to localise one or more of the excitation pulses. The quantitative information from such experiments has the potential to disentangle complex hybrid wave functions into wave functions of the individual emitters. The primary aim of this project will be to develop a scheme for CMDS with nm spatial resolution. This will then present many exciting opportunities to explore the interactions between different systems of very different length scales. Possible applications of this technique involving other project areas within our group include coherent coupling between well-separated quantum dots or CMDS experiments on a single light-harvesting complex, or even local excitation of specific chromophores within a single light-harvesting complex. Semiconductor quantum wells and quantum dots confine electrons and/or holes in one and three dimensions respectively, in a manner similar to the preliminary problem in quantum mechanics of a particle in a box. The great advantage of these QDs and QWs is that the properties can be easily varied by controlling the way in which they are grown. This allows us to use them as a template for testing fundamental quantum phenomena. One such question is the role played by quantum mechanics in photosynthesis, which has been a hot topic over the past 5-10 years. 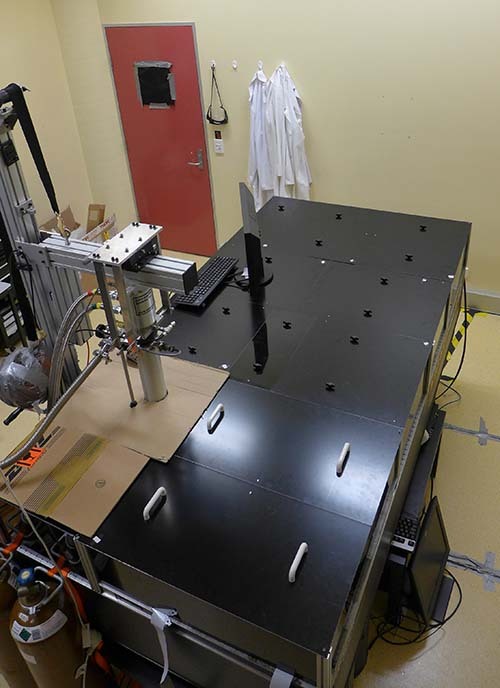 In this project you will utilise the unique experimental capabilities for coherent spectroscopy developed at Swinburne to test various theories for “quantum enhanced” energy transfer. Coherent Dynamics in Atomically Thin 2D Semiconductors. The discovery and of graphene and the subsequent development has led to a huge range of applications based on the remarkable properties of this atomically thin material. Since then there has been numerous new atomically thin 2D materials discovered with similarly interesting and useful properties. Amongst these 2D semiconductors ar of particular interest because their band gap in the visible spectral regions immediately lends them to light absorbing/emitting applications. Indeed, these materials interact very strongly with light, such that even with the naked eye absorption and emission can be easily seen from the 2D layer a single atom thick. These are very new materials and many of the fundamental properties are still not well understood. This project will utilise the state-of-the-art coherent multidimensional spectroscopy capabilities developed at Swinburne to reveal coherent dynamics and the fundamental interactions between optically excited electrons and with their local environment. Revealing New Two-dimensional Physics in Atomically Thin 2D Semiconductors. The discovery and of graphene and the subsequent development has led to a huge range of applications based on the remarkable properties of this atomically thin material. Since then there has been numerous new atomically thin 2D materials discovered with similarly interesting and useful properties. Amongst these 2D semiconductors are of particular interest because their band gap in the visible spectral regions immediately lends them to light absorbing/emitting applications. Indeed, these materials interact very strongly with light, such that even with the naked eye absorption and emission can be easily seen from the 2D layer a single atom thick. This project will seek to exploit these light matter interactions to control and explore the interactions between electronic and nuclear degrees of freedom in 2D. You will utilise coherent nonlinear spectroscopy to explore the interactions between vibrational modes in the 2D crystal and the excited electronic states. Gold nanoparticles in various shapes and with different surface treatments are being developed for use in cancer treatment. The mechanism essentially involves the absorption of visible or infra-red light by the nanoparticle and the subsequent conversion of this absorbed energy into heat, which can kill the targeted cancer cells. The efficiency and effectiveness of this type of “photothermal therapy” depends critically on the specifics of the nanoparticles and how well they convert the photon energy into heat. In this project you will use femtosecond laser pulses and the world-class THz time domain spectroscopy experiment within the Swinburne ultrafast spectroscopy group to quantify the dynamics and mechanisms of the photothermal heating of various different gold nanoparticles.